With every post, I slowly remember techniques I long ago forgot. BRYAN REACHED POST NUMBER 13! Forgive my absence Thursday; I received a web design job for another webcomic site, and I must spend the time I normally spend making bonus-comics working on that. I’ll be working on the site for at least another week, so don’t expect a comic this Thursday (there MIGHT be one, just don’t expect it). You also may or may not have noticed the site was down for a bit a couple days ago. Long story short, my previous host kind of sucked. I have since switched KakuJomics over to Dreamhost hosting and the site is much snappier, now, I’m happy to report! 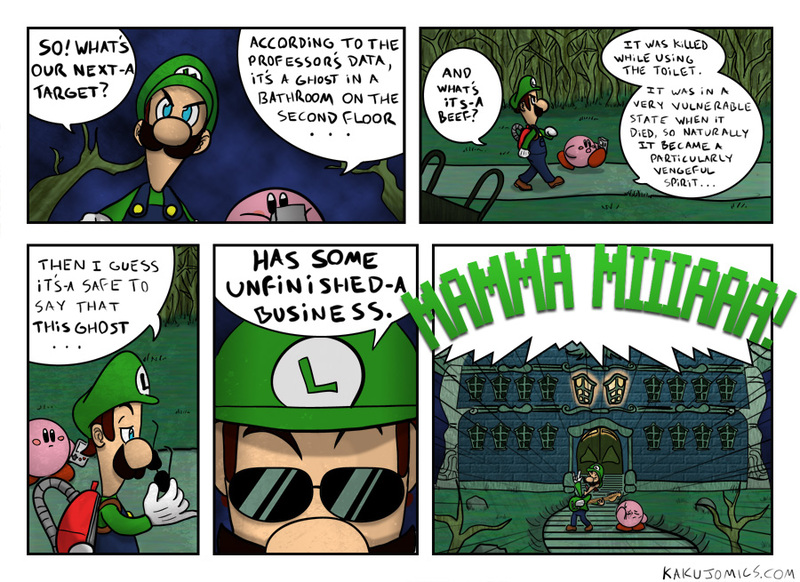 I followed your link over from the bitf forums, and I’ve gotta say that I’m really impressed, and not just because no one normally gives Luigi any love. You’ve got some real talent, and shouldn’t be worried on whether you’re good or not. You are. Now make with the more funnies. This is my new favorite comic. Two kinds compared to this is nothing. That’s fantastic! Thank you so much, friend! Do you have a facebook? Maybe I could add you as a friend? I don’t wanna know how he got the Poltergust 3000 from Kirby either XDXD jk I do. I LOVE your comics. I gotta thank Whispershadow for showing me them! They’re awesome! Have you tried a dark moon comic?